Alexx is an advocate for all things she coins the ‘low tox life’ – which is quite simply, living a life where we make positive choices when it comes to food, sustainability, personal care, home and our mindset. She truly believes that there should be no guilt or shame in realising we’ve not been perhaps making the best choices – enough with the guilt and fear! She focuses her education in moving forward with excitement, implementing changes at a pace that suits every unique individual. Alexx is passionately dedicated to awakening people to all the little things we can do to shape our health (and in turn, the world!) through her e-courses, her website www.lowtoxlife.com, social media channels and community portals and various speaking and workshop events. She believes strongly that grassroots community education are what make our world a better place. 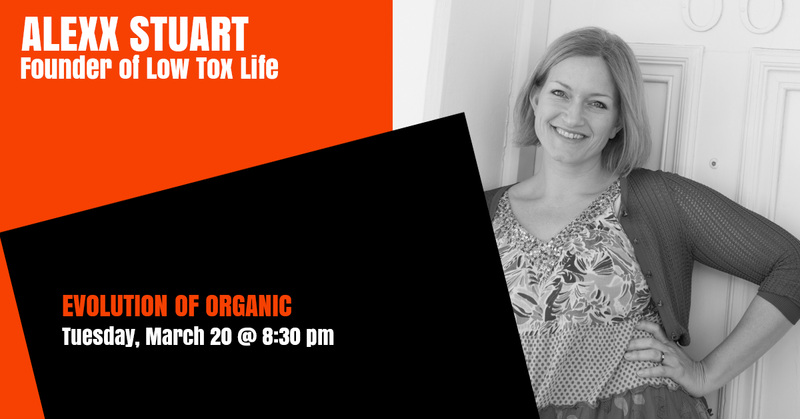 Alexx Stuart is the author of the upcoming book The Low Tox Life: a guide to anyone curious about how and why to make the switch to more natural options in this day and age, doing it with whatever resources you have and whatever knowledge base you’re operating from. She covers home, body, food and mind and looks at how not-so-safe things come into our products, which ones to exercise healthy caution over, and what to do instead whether you’re more of a DIY’er or prefer to switch to products.